Over $10,000,000 in instant, available prizes. Two lucky customers have a chance to each win $1,000,000! RICHMOND, VA—GPM Investments, LLC is pleased to announce the launch of their new fa$ MILLION Sweepstakes and Scratch Card Game! This game runs January 3, 2018 – May 1, 2018 and it benefits all customers, especially their fas REWARDS® loyalty customers. And such a fun way to start off the New Year! Customers can purchase qualifying items such as a King Size Reese’s, Kinder Joy, Lance Popcorn and Slim Jim Giant, just to name a few, which will earn them a fa$ MILLION scratch card with up to $10,000,000 in instant, available prizes. Instant prizes like $100—not a bad day at your local c-store, right?! With every qualifying purchase, enrolled fas REWARDS customers will not only receive a scratch card, but they’ll also gain entry into a drawing for a chance to win $1,000,000! The first drawing will take place roughly mid-way through the sweepstakes and the second drawing will take place at the conclusion. So what does it take to become a fas REWARDS member and have a chance to win during the fa$ MILLION sweepstakes?!? For starters, it’s easy and it’s FREE! The fas REWARDS loyalty program is offered in all 960+ GPM Investments c-stores. This loyalty program is GPM’s free customer appreciation program to say “thank you” for each and every customer’s business. Customers simply pick up a card at a participating location and they can enroll their card in minutes via the fas REWARDS website or customer service number. 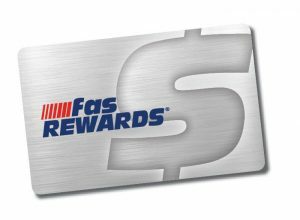 Once enrolled, when customers make a purchase at a participating fas REWARDS location, they earn points to spend however they choose. They’ll also enjoy exclusive, buy-one-get-one FREE deals, club programs and earn BONUS points on select items. Join GPM at their participating Admiral, Apple Market, BreadBox, fas mart®, Jiffi Stop, Jiffy Stop, Li’l Cricket, Next Door Store, Roadrunner Markets, Scotchman®, shore stop®, Village Pantry® and Young’s locations to enroll in fas REWARDS and play the fa$ MILLION Sweepstakes & Scratch Card Game today!